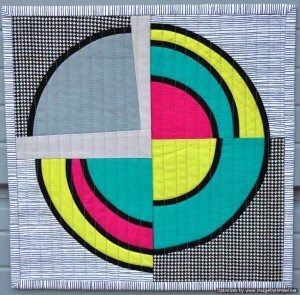 Create a 12” x 12” modern quilt complete with your choice of binding. Think modern when designing your quilt, ie. minimalism, negative space, and use of colour, to name a few design concepts. Must be completed by August 15th. 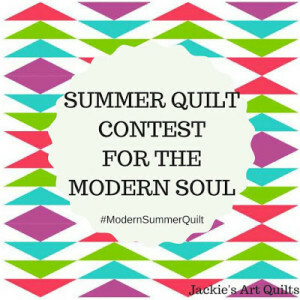 All participants will be able to upload their project from July 15th until August 15th at Jackie’s Art Quilts blog (here). Judging will take place and winners will be announced August 20th. Open to anyone. 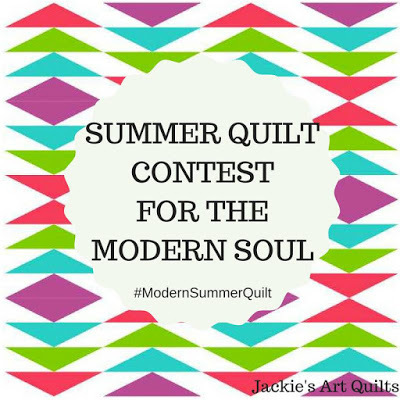 This is my entry in the #ModernSummerQuilt challenge. The pieces of this quilt were constructed in a Terry Aske Circles, Circles, Circles workshop that our guild held on March 22, 2018. Although Terry taught us the technique, the design is my own. When I brought the four quarters of the block home from the workshop I almost discarded them as they sure didn’t look like much. Once I gave them a good press and trimmed up the edges, I could see the potential and when Jackie announced the challenge, I was inspired to finish the piece into a 12 in square miniature quilt.